My 3 week old daughter’s big toe nail looks like it is ingrown. There is no redness or tenderness. What should we do? 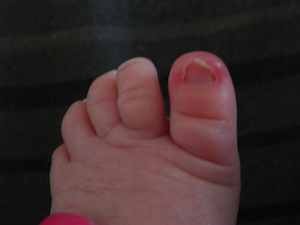 Newborns often appear to have ingrown toe nails. Thankfully, these rarely lead to problems. Newborn nails are flexible and rarely become red, tender or infected. Simple watch the area for infectious signs (redness, warmth, tenderness or drainage) and do not trim the nail. Given time the majority of children will out-grow this.